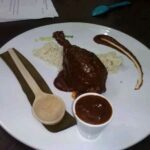 The mole poblano is a cultural specialty of the city of Puebla. Originally it consisted mainly of a sauce of a great variety of ingredients poured on pieces of turkey, name that is given in Mexico to the domestic turkey, although at the moment it is common its use with chicken or other meats, being one of the most representative dishes of Puebla . Quick dishes can be created as they are: the mole poblano enchiladasde stuffed with shredded chicken. These enchiladas are prepared very easily with ready-to-serve mole and rotisserie chicken. 1 turkey or large turkey cut into pieces and cooked in a good broth made with carrots, pore, onion, a branch of celery, parsley and a clove of garlic. Chilies are passed through 300 grams of hot butter, placed in a pan with very hot water and left to boil to soften. In the same butter the garlic and onion are fried, add the tortilla, the bread, the raisins, the almonds, the chili peppers, the sesame half, the anise, the clove, the cinnamon, the peppers, the chocolate and the tomato and fry everything very well; add the drained chilies and fry a few more seconds. All the above is ground in the blender with the broth where the turkey was cooked and strained. In a special clay pot for mole, heat the rest of the butter, add the sauce, let the mole boil for five minutes, season with salt and sugar and, if necessary, add more broth; there must be a thick sauce. Let it boil for another 25 to 30 minutes over low heat, add the pieces of turkey and let it boil for a few more minutes.